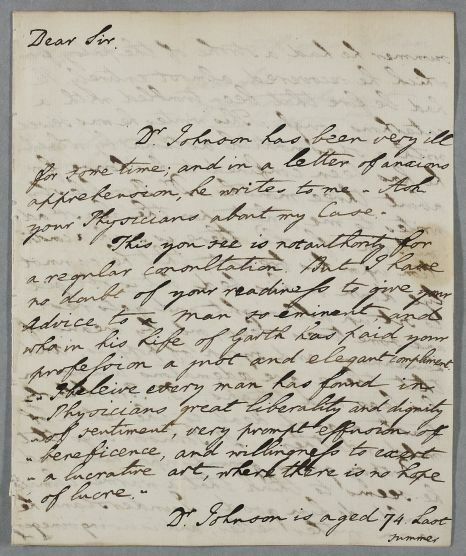 Letter from James Boswell, concerning the case of Dr Samuel Johnson, who has 'been very ill for some time'. 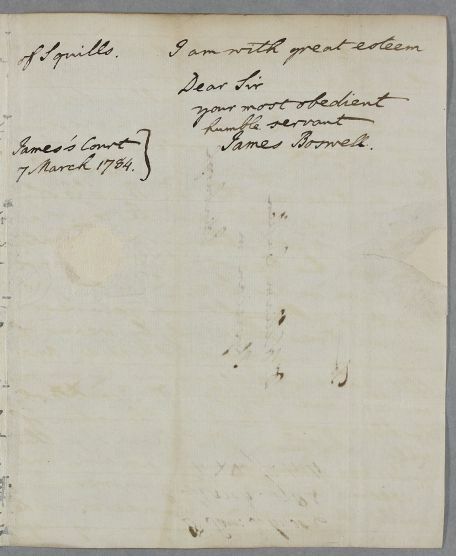 Summary Letter from James Boswell, concerning the case of Dr Samuel Johnson, who has 'been very ill for some time'. Case of Dr Samuel Johnson who has asthma and dropsy. profession a just and elegant compliment. 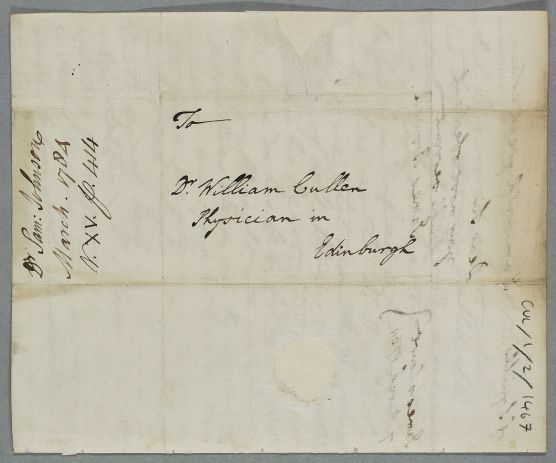 1: Johnson had dined with Cullen in Edinburgh on the evening of 16 August, 1773, when the physician ‘talked, in a very entertaining manner, of people walking and conversing in their sleep’ (Frederick A. Pottle and Charles H. Bennet (eds) Boswell’s Journal of a Tour to the Hebrides with Samuel Johnson, LL.D. 1773 (Melbourne, London, Toronto: Heinemann, 1963), p. 7. 2: Johnson’s ‘Life of Garth’, first published in 1779 as part of what was later entitled The Lives of the Poets. Dr. Samuel Garth (1660/1-1719) combined the roles of doctor and poet. His most celebrated literary work is The Dispensary (1699) a mock-heroic poem depicting the professional rivalry between the London physicians and apothecaries as a burlesque Homeric battle. 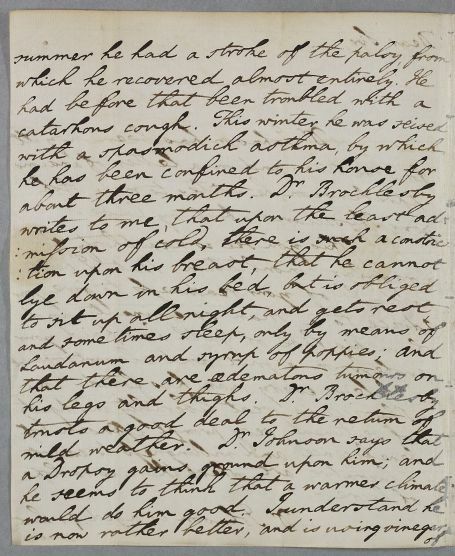 3: 'I believe...no hope of lucre’ is an accurate quotation from Johnson’s ‘Life of Garth’ (see note above). 4: Samuel Johnson was born at Litchfield in Staffordshire on 18 September (N.S.) 1709. 5: Cullen specially addresses ‘spasmodick asthma’ in First Lines, pp. 403-6; and MM, p. 298; and 352. 6: Johnson lived at Gough Court in the City of London, the present-day 17 Gough Square, which is now a museum. 7: Dr. Richard Brocklesby (1722-1797), the London physician and medical author treated Johnson for the last eighteen months of his life. They became close friends. 8: Since 1771 Boswell and his family had been living in a tenement apartment in James’s Court, off the Lawnmarket in Edinburgh. It had formerly been the home of Cullen's associate, the philosopher David Hume.